Munich – The beer tents at Oktoberfest were packed Saturday even before the mayor of Munich, Christian Ude, had officially inaugurated the annual festival beer with two whacks of a hammer to open the first keg. 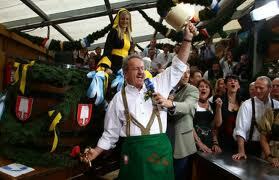 This year’s Oktoberfest, set to run till October 4, is the first where smoking is banned. Munich is standing by for 6 million visits. At noon, Ude, wearing Bavarian leather shorts and a green apron, performed the traditional opening ceremony: hammering a tap into the first wooden barrel of beer using a 3-kilogram hand mallet. He then handed out mugs of beer to VIP guests.